Floral stencils are making a huge comeback! We're seeing florals everywhere from bedroom walls to nurseries. Our Floral patterns are perfect for decorating walls and ceilings, stenciling floors and fabrics, embellishing pillows, furniture and various craft projects. Nothing says "feminine" more than a beautiful floral pattern. But why settle for floral wallpaper, when you can get a similar or even better look with floral stencils, AND save a ton of money? Our flower stencils are fashionable, economical, super versatile and are very easy to use! 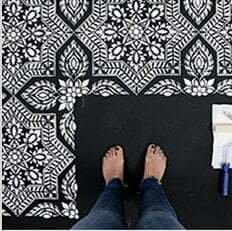 Learn How To Stencil by watching our expert video tutorials and let's get your walls blooming!